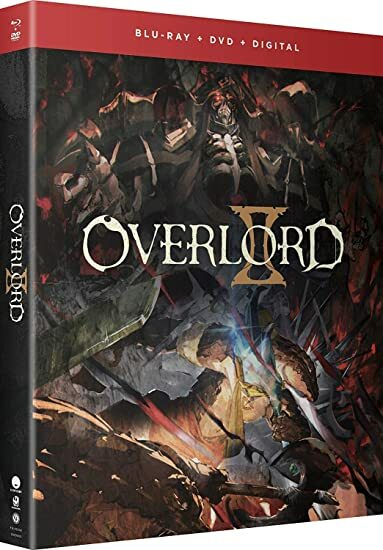 Overlord II: Season Two - BUY THIS BLU-RAY! Bow before the great and powerful Ains Ooal Gown—the overlord returns! Continuing his quest to rule this new world, Ains begins to put the pieces in place for his conquest. But between a Lizard Man tribe uprising, and performing missions as adamantite adventurer Lord Momon, Ains has his work cut out for him! Thankfully he has his most loyal and willing subordinates to do his bidding. Following the orders of his master, Sebas works undercover in the Re-Estize capital gathering information. But when he stumbles upon an injured girl, he becomes wrapped up in the affairs of the mysterious group Eight Fingers. Will he betray his orders and the plans of Ains Ooal Gown in order to protect her, or will he find a way to help his master's goal? Nothing and no one can stop the supreme and mighty overlord in his quest to rule all! THEN SEND IN A COMMENT ABOUT YOUR FAVORITE FUNIMATION TITLE (you may click on artwork above for a refresher) PLUS YOUR NAME AND ADDRESS TO contests@efilmcritic.com or WeLoveHBS@aol.com. (Just one e-mail please.) Put [b]"FINALLY A SEQUEL TO YOR" in the subject line and cross your fingers. We will draw names and one of the prizes could be yours. Only 1 entry per household.